Inventory We are a resale marketplace, not a box office or venue. Ticket prices may exceed face value. This site is not owned by Smoothie King Center . The Smoothie King Center opened October 19, 1999 and is currently the home of the National Basketball Associations New Orleans Pelicans. Smoothie King Center was constructed for a total cost of $114 million. 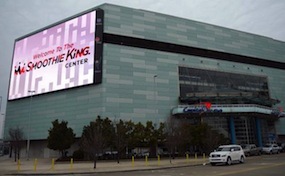 The Smoothie King Center box office provides up to 19,000 seating capacity for concerts and 18,500 for Hornets games. Smoothie King Center is located in downtown New Orleans across from the Superdome at 1501 Girod Street. The Arena has hosted many big events like the 2008 NBA All-Star Game, NCAA Tournament, ArenaBowls, and the 2004 Women's Final Four. Some of the most memorable Smoothie King Center tickets have included the WWE, Van Halen, The Police, Tim McGraw & Faith Hill, Metallica, The Eagles, The Jonas Brothers, and Celine Dion. The Arena was also used for medical operations in the aftermath of Hurricane Katrina. SmoothieKing.CenterNewOrleans.com is a privately held company that specializes in the sale of tickets in the secondary market. We are not affiliated with any official supplier or box office. To purchase tickets to any Smoothie King Center events simply call our operators at anytime or click on the event you wish to attend.